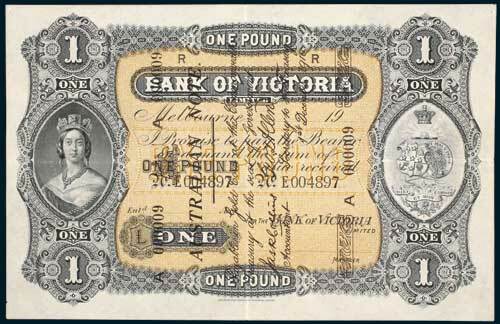 ONE POUND, Collins/Allen (1910), superscribed issue on a Bank of Victoria, one pound, Melbourne, 19-, No. 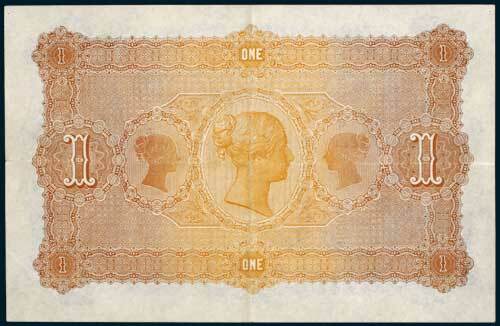 E 004897, superscribed serial A 000009 (R.S21(a), this note illustrated p39 Nicholson 2nd Edition 1979). A magnificent example, with quarter folds, two small pin holes in top corners, otherwise extremely fine and extremely rare, the finest known from this bank and the lowest superscribed serial number known in private hands. Ex Sir George Foster Pearce, Max Stern & Co Sale 17th November 1976 (lot 656), Dr Alan Nicholson Collection, Noble Numismatics Sale 49B (lot 1670) and Sale 79 (lot 2974).